Captain Robert Peel, CD of The Canadian Scottish Regiment (Princess Mary’s), was awarded the Medal of Military Valour. Captain Peel was deployed to Afghanistan to serve as a mentor to an Afghan National Army company, when their team was ambushed by Taliban insurgents on June 4, 2008. With little chance of survival, his team exposed themselves to great peril and retaliated against the enemy while encouraging the Afghan soldiers to do the same. While a two-man Canadian team secured an extraction route, Captain Peel and two other soldiers executed a fighting withdrawal while the Afghan soldiers retrieved their wounded comrades. Because of the dedication, leadership and valour many Afghan and Canadian lives were saved. The Medal of Military Valour was created January 1, 1993 and is awarded for an act of valour or devotion to duty in the presence of the enemy. Capt. 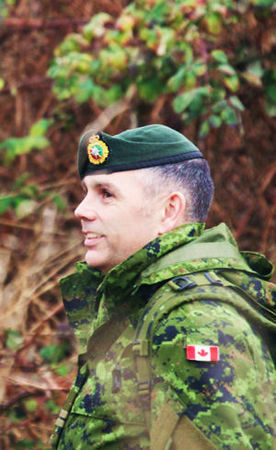 Mike Soley, with the Canadian Scottish Regiment, A Company of Victoria, received the Canadian Expeditionary Force Commander's Commendation for leading his troops by example, exhibiting courage and resolve. Cpl. Justin Cervantes of the Canadian Scottish Regiment, B Company in Nanaimo was awarded the Canadian Expeditionary Force Commander's Commendation for his achievements in Afghanistan. Capt. Slade Lerch, originally a Canadian Scottish Soldier and then transferred to the Regular for and serves with 3 PPCLI. Was attached to the Edmonton-based third battalion of Princess Patricia's Canadian Light Infantry, received the Canadian Expeditionary Force Commander's Commendation for his supervision over five Canadian and 60 Afghan soldiers at the remote outpost. The citation praises Lerch's calm and firm command in the wake of a horrific enemy attack in July 2008. "His mentoring and hands-on assistance ensured the [Afghan] company's leadership remained intact," the citation says. Mortar shells launched by insurgents regularly pummelled the area around the camp. One day the mortar shells hit their mark, which Lerch down plays. "The bad guys got a couple of good shots in. We had a particularly effective mortar strike in the camp and half the camp burned down." Canadian supplies were incinerated and the fire meant the Afghans lost money they used to buy goods and equipment. Three Afghan soldiers were hurt and airlifted to hospital. There was no one to call for immediate help: The camp could only be reached by a convoy of 65 vehicles that would travel 10 to 12 hours to get there "and they'd be fighting most of the way," said Lerch. Lerch and his colleagues did what they were trained to do. "We continued to soldier on. We held our ground. "We continued like nothing happened." While many Afghan soldiers were brave and professional in their role defending their country, some were reluctant to leave camp to go on patrol and risk harm by roadside bombs or enemy gunfire. "I spent a lot of time cajoling them -- we have got to get out there," said Lerch. "If we just stay in our little camp, the bad guys could move around all they want and really ruin our day." After 60 days at the remote camp, Lerch returned home. It was his second tour in Afghanistan and he's not ruling out returning for a third. "My wife has given me tentative approval for another tour," he said. The couple have four-year-old twin boys who were born while Lerch was doing his first tour in Afghanistan. Lerch is modest about his accomplishments and says receiving the commendation is humbling. "I was just happy to come home in one piece to my wife and kids."